To ensure you earn your Cash Back, do not visit any other Cash Back, price comparison or coupon site prior to Dubli.com. Only coupons and promotional codes that are provided on Dubli.com are valid. 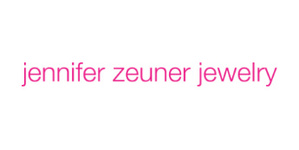 Jennifer Zeuner Jewelry's jewelry reflects her own personal style, simple with a spiritual twist. The jewelry lends itself to be layered. The same simple piece can reflect a different mood when layered and worn differently. People that have their own unique style inspire the designer. She loves it when people put things together in a creative, unexpected yet cohesive way. Cameron Diaz was the first celebrity to buy Jennifer Zeuner's jewelry almost ten years ago. She was extremely honored because she considers her style an inspiration. Since then many celebrities including Jennifer Lopez, Beyonce, Jessica Alba, Taylor Swift, Miranda Kerr, Rihanna, Sarah Jessica Parker and countless others have been spotted wearing her jewelry too.